Since moving to Brighton 18 months ago I’ve been pretty busy finding my feet, moving house twice, sorting out schools and setting up Linden Lab Brighton, so I haven’t had as much time to make music as I’d have liked. It hasn’t helped that my brother Roo, who collaborated with me on Vanishing Trick has gone from being a medical student to an opthalmologist, so has been pretty busy too. I’ve still been reading create digital music though, so couldn’t resist buying Luke a copy of Korg DS-10 for his birthday just before Christmas. It’s a great piece of software that reminds me a lot of ReBirth (which is now free!) — the same infectious acid sounds and a fun interface that you can’t resist tweaking. Within hours Luke was coming up with screaming synth noises that would have made the Chemical Brothers proud, so I told him that when he had a track finished we could record it on to the computer, add some more sounds and make a CD. 30 minutes later I had Luke to thank for finally convincing me to unpack my bag of midi and audio cables for the first time since we rolled up in Brighton. While adding bits to Lukes DS-10 and Electroplankton creations, I took the opportunity to finally play around with Ableton Live properly and was completely bowled over. It’s one of those pieces of software that as a software engineer you can’t help admiring. It makes you want to use it and turns the complex process of sequencing and producing music in to joyful fun. I’d been a Cubase user for 10 years, but I’m not going back. Over Christmas I put together a Live rig that lets me use my ancient Yamaha MFC05 MIDI controller to switch between drum beats, record guitar loops and automatically switch between effects settings without touching the computer. With some tweaking I’m going to get it to do the same for my Nord Modular and switch patches on both the Nord and my POD allowing me to quickly record, compose, arrange and perform music from 5 foot pedals. I’ve also got ITM set up on my iPhone which I’m planning to mount on my guitar giving me a wireless X/Y touchpad that can control any number of Ableton parameters. I also finally got round to playing around with circuit bending for the first time. 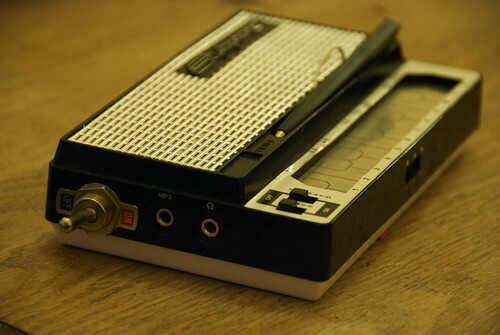 Last Christmas Roo got me a reissue Stylophone, which is a fun toy, but whenever I read about circuit bending online I kept thinking it would be fun to try connecting the headphone output of the stylophone to the MP3 input. In the end it only took an hour or so of poking around inside the Stylophone while telling Luke about electronics to find some bend points that turn the mild mannered Stylophone in to a wailing banshee of feedback distortion that’s more Hendrix than Harris. The modded Stylophone is shown below and I’ve added annotations to a picture of the opened up Stylophone on Flickr that shows the points that I connected. If you’d like to hear the evil sounds it makes there are a selection of Creative Commons licensed samples on Freesound, but I advise turning the volume down and using headphones if you give them a listen. It’s great to be having fun making music again. Thanks Luke and Roo!